For this fun lesson, students were given this locked box filled with treats/candy. The class was divided into groups of five. It was their job to find out what the combination of the lock to get all the candy. In order to do this, students were required to finish a set of nine math word problems. 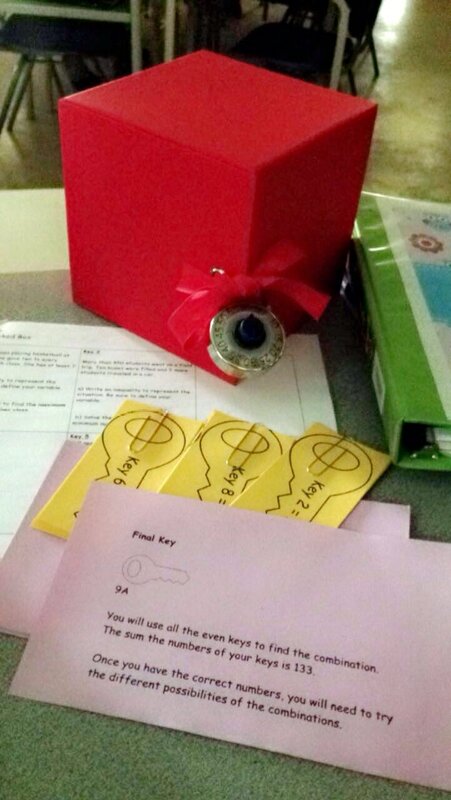 For each correct answer students got a key, as seen in the picture on the left. Once a group obtained all nine keys, they were given a final clue which told them how to order the numbers on the keys, into the combination of the lock. Solving Math Equality Word problems. In grade 9 math, students are required to solve algebraic word problems with a variable on either side of the equal sign. Further adding to this challenge students are also required to solve these equations when presented in a word problem. To help students learn this skill, I asked that students to come up with their own word problem. To further add to this project, students were required to teach their problem and how to solve it to the younger grades. Below is a link to an example of how one student tackled this assignment. Students were given a blueprint of a house. This blueprint was designed to be flawed. Since students were not given the measurements of the house, they had to use algebra tiles or draw algebra tiles on the blueprint to measure the dimensions of the house and calculate the area and perimeter. Their next task was to redesign the house and determine the area and perimeter of the new changes. To further add to the project, students were given images of true hardwood floor pricing and had to calculate the the cost of flooring. To add to the authenticity, students had to determine an area in Calgary where their house would best fit.